This meal first appeared at the Nook Tavern (www.thenooktavern.com) last fall, and was an immediate success. It's a braised pork tenderloin, smothered with a savory molasses-herb sauce. 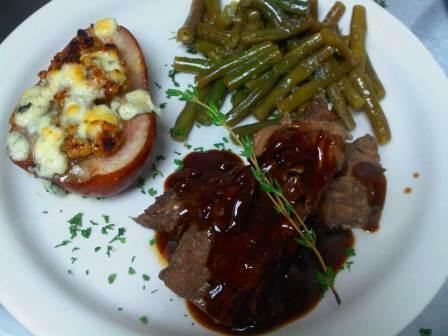 The pork loin is accompanied by citrus butter green beans, and roasted pears covered with walnuts, Gorgonzola, and a whiskey honey glaze. For those living in Huntsville, AL, this meal will be making an encore performance next Saturday! Eat good food. Drink good beer. And above all, stay classy!